Shows & Projects — Where Have They Hidden All The Answers? Where Have They Hidden All The Answers? A research project, a ten-minute performance for a solo audience member, an installation piece. 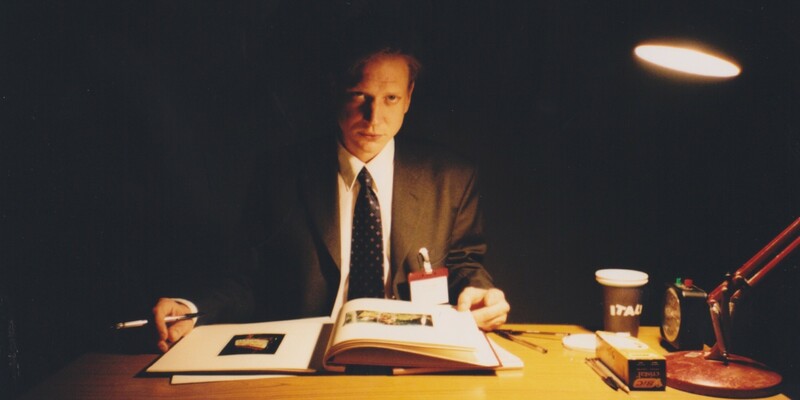 Commissioned by The National Review of Live Art/New Territories Festival, Glasgow, 2002. Supported by The British Council. Remade in Portugal (2003) as Onde Que Eles Esconderam As Respostas? 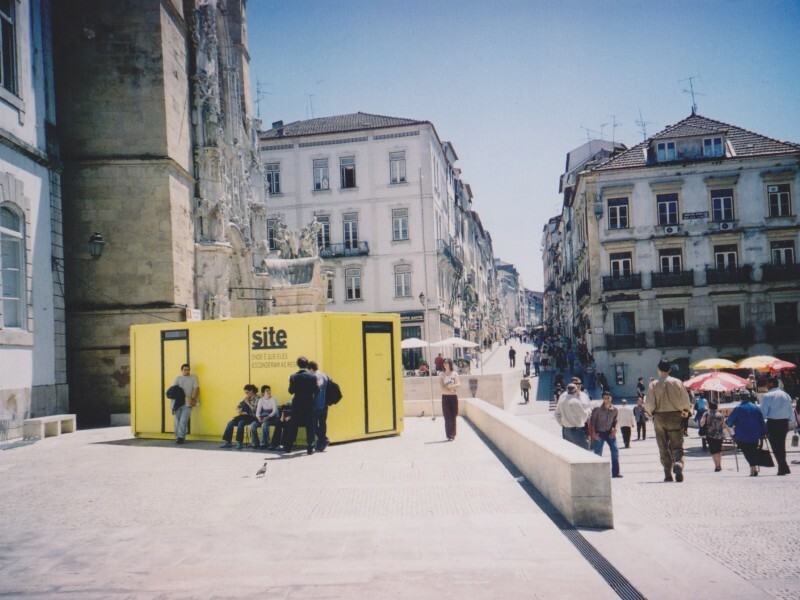 for the SITE Festival, Coimbra, in collaboration with Ao Cabo Teatro and supported by The British Council. Remade in France (2005) as Où Ont-ils Caché Toutes Les Réponses? for Scènes De Vie, commissioned by Centre Culturel Suisse. We get the cheap suits and matching haircuts in Sheffield. The hairdresser – my hairdresser – is visibly distressed when I tell her what we want. She’s been slowly nursing me away from my very long hair for several years now, with the promise that she will eventually get to cut something other than ‘not short’ into it. But this isn’t what she was hoping for: short back and sides, side parting; the squarer we look, the better. She cuts me first. I look suitably geeky. The she gives Jerry exactly the same cut. He looks cool. The suits are £40 each, machine washable. We want to look like we are at work. Dressed for work. The regular discussion about outfits and clothes instead of costume. Our reference point is the people who stop you in the pedestrianised bit of the city centre with a clipboard, who want to know if you wear deodorant or like crisps. It’ll only take ten minutes. They are mostly women (on Sheffield’s Fargate, at least), and the few men amongst them are a bit stuck as to what to wear. A suit, in order to look smart – they’re Dealing With The Public, after all – but they’re outside all day, might need a coat over the suit, it’s going to start to look shabby. They don’t want to wear their best suit, or buy a new expensive one. So forty quid machine washable is just the job. I look like an estate agent. Jerry looks like a spook. Glasgow. 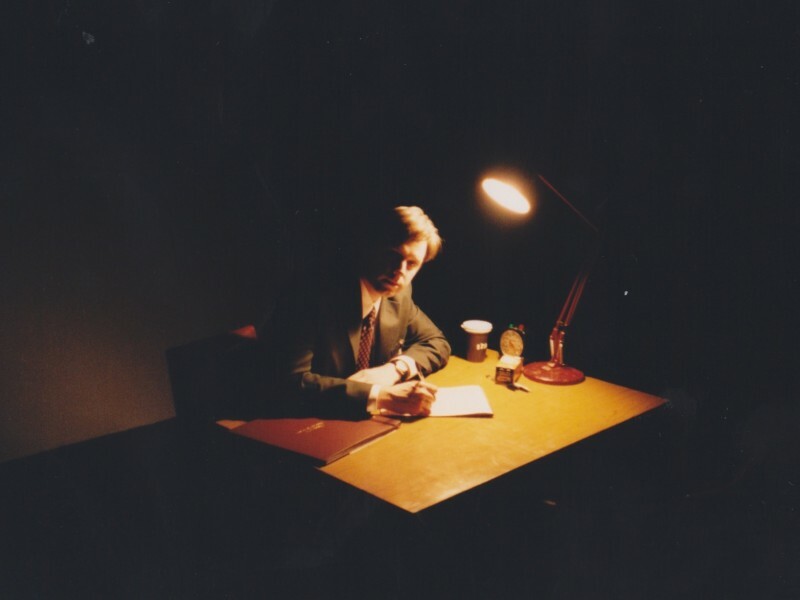 We set up our research space downstairs in the Arches, in a pair of rooms I think of as Franko B’s rooms, having taken part in one of his one-to-one performance experiences in there the year before (with Aktion 398). We kit the space out on the Thursday: table, two chairs, desk lamp, evidence book, questionnaire forms (duplicate), mini-disc recorder. 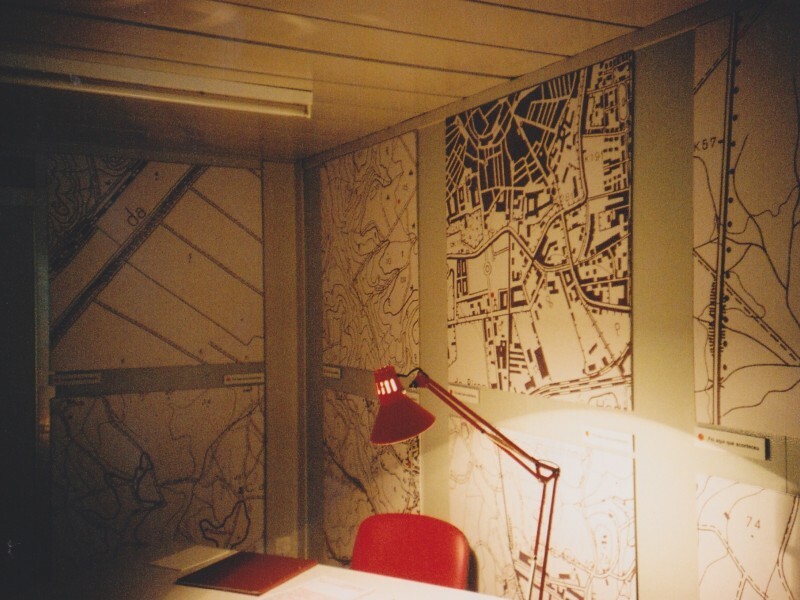 On the walls are a series of blown up A-Z map squares with a single red dot on each one: This Is Where It Happened. Our research project is called Where Have They Hidden All The Answers? We start work on the Friday. Wearing our suits, carrying clipboards through the Arches café bar, I am surprised by how much attention we attract. Lois Keidan, who I will later watch painting Michael Mayhew in his own blood (in A Sequence of Actions That Matter), looks genuinely shocked by our attire. How do you cause a stir at the National Review of Live Art? Turn up in suits and ties. Downstairs we get to work. One of us out in the corridor, marshalling our participants, managing the list; the other, in the second room (the first room acts as a sound lock), conducting ten minute interviews. We are sharing stories: trying to convince our participants, who experience the work one at a time, that a particular urban legend is true, then recording an urban legend from them, or, in fact, any story that they want to tell us. I am often struck by how keen they are to get the story right; taking a moment to think it through, correcting themselves, retelling a key moment. After we have taken their story they sign the questionnaire and take the top copy for themselves. We show them out of the room through a different door, into a narrow corridor that leads them back to the café bar. We find out later that on at least one day, our interviewees gathered around a table in the bar; you weren’t allowed to join them if you hadn’t ‘been in yet’. An evolving group, sharing their experiences. What story were you told? What story did you tell? Of course we never see this group. But it is gratifying to find out afterwards that not only were we collecting stories, we were helping to spread them, too. We made Where Have They Hidden All The Answers? our first one-on-one performance, for the National Review of Live Art in 2002. In 2010 we were honoured to be asked to contribute something to the NRLA 30th Anniversary Catalogue, which is what the text above was written for. The Catalogue itself is a thing of beauty, edited by Dee Heddon, Nikki Milican and Jennie Klein, with contributions from so many massively influential makers of Live Art it would be churlish to mention just a few. Originally available only at the NRLA earlier this year, the last few copies are available online from the New Territories website. As part of the build up to presenting Cape Wrath at West Yorkshire Playhouse’s brilliant Transform festival in 2014, I was asked to write a response to a set of questions, that was then posted as an “Introducing…” interview. It’s mainly about Third Angel in general, our relationship with Leeds, and Cape Wrath in particular. (You can read the whole thing here). …tell us about a transformative experience for you or your company? And the story that came to mind was one I’ve told a couple of times when teaching or talking about our work. I’d last told it as part of a performance called Serial Collaborator, at Northern Stage’s Stronger Together event, back in 2011. For Stronger Together, a really great, timely event exploring (rather than just talking about) collaboration, I was invited by Erica Whyman, then Artistic Director of Northern Stage, to do a performance of some kind. I somewhat rashly proposed a performance in which “I talk about everyone I have ever collaborated with. In 20 minutes.” Erica kindly, and almost as rashly, said okay. Once I was preparing it, I went through a process that felt familiar from making Class of’76, of initially wanting to talk about everyone equally, but then realising that that did no-one any justice, and wouldn’t be at all interesting. So the format evolved to become one in which I named everyone (I could think of) who I had ever collaborated with, and talked about some people in more detail in order to discuss different kinds of collaboration. In amongst that I wanted to talk about students and audience members, and the ways in which they are part of the conversation of, and development of, the work. So in both instances one (or a few) individuals were able to stand in for their ‘group’. And the audience member to talk about was obvious to me, because he had changed the way we understood our own work. And, after that slightly discursive intro, here’s the story. 2002. We are at Angel Row Gallery in Nottingham, presenting our show Where Have They Hidden All The Answers? WHTHATH? (as we refer to it), is a one-to-one “interview performance”, in which we tell the audience member the story of an urban legend, as if it is true, trying to convince them that it is researched fact - claiming we know the first instance of the story. Towards the end of the piece we ask the audience member if they know of “any stories like that”, and if they could tell us one? I realise that of course I would like that, even if the story isn’t the “right” sort of story, the sort of story I think I’m looking for. The man tells me that when he was little, about seven, his mum was really ill. She was dying, in fact. She’d had to start sleeping on the sofa, too weak to climb the stairs. His aunt came to stay, to look after them. One morning he came down stairs and his aunt told him that his mum had died in the night. He looked at her, lying on the sofa. He could see her hand sticking out from under the blanket. He wanted more than anything to go and hold his mum’s hand. But his aunt told him he had to go and get the doctor. When he came back with the doctor, there were more people around, and his mum’s arm had been tucked back under the blanket, and he never did get to hold his mum’s hand. And that was the day I understood, whatever story is that the person sitting opposite wants to tell us, that’s the story we need to hear.